A few years ago, UMaine students made it their mission to dance for twelve hours to put a smile on a child’s face that would last a lifetime. This was the beginning of Black BearTHON, the University of Maine’s Miracle Network Dance Marathon. Over the years, they’ve stayed true to their mission, but recently, the Exec Committee decided to expand that mission, and Black BearTHON teams and dancers are encouraged to support their “adopted” family throughout the year. 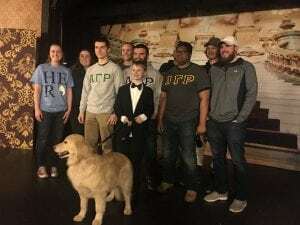 And the brothers from Alpha Gamma Rho UMaine, along with with Ali and Caroline from the Black BearTHON Exec Committee did just that last night when they joined the Bangor Children’s Miracle Network Hospitals team at Next Generation Theatre’s performance of Annie, starring our friend Gabe!